An intoxicated Ardmore teenager was arrested Wednesday morning inside a neighbor's home. 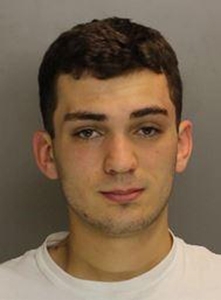 19-year-old Ryan Bangs has been charged with burglary, criminal trespass, theft, theft from motor vehicle, receiving stolen property, public drunkenness, and underage drinking. At 6:30 a.m. on Wednesday on the 100 block of Simpson Road in Ardmore the homeowners were awakened by footsteps downstairs. They investigated and confronted the drunk teen, whom them do not know, inside their home. That's when they called police. Police say that Bangs entered through an unlocked door and stole cash, a cell phone, liquor, and other items. Bangs is also accused of stealing items from their car parked in the driveway and another car parked on their street. Bangs lives about a half a mile from the house he burglarized on the 700 block of Clifford Avenue. A fire broke out in a Camden County commercial building this afternoon. It happened around 1:15pm on the 100 block of Cooper Road in West Berlin. The building belongs to water purification company Resin Tech. Around 150 firefighters were dispatched to fight the three alarm blaze. Twelve people inside the building at the time got out safely. The building is primarily used for shipping. It would have been a significantly worse situation if the one next door caught fire since it contains materials used in the manufacture of the water purification systems. The fire was brought under control by mid afternoon.